Q. Secure routing Protocols for Wireless Sensor Networks? A secure routing information protocol enables effective implementation of authentication and integrity checking defenses against spoofing of routing information and Sybil attacks. Security holes in WSN networks are caused by interception and attacks on broadcast routing information by the base station. Here, an intruder intercepts and modifies broadcast routing information when there is no proper authentication. A security solution is to use a secure routing protocol that relies on the concept of one way hash chain. In this case, the "input information is hashed based on a hashing algorithm which takes a variable length of text and produces a fixed length hash value". The computational infeasibility of reversing the hash value into the original message provides the message integrity required to ensure secure information broadcast to destination hops in the WSN by the base node. The technique involves the sharing of keys with each network node based on the one way hash chain generated by the base station having Kn keys of length n, with K1 sent to each node in the base station with loose synchronization. The packets arriving at the base station are authenticated using the message authentication code (MAC), with each of the packets arriving at i intervals. The destination node uses the key to authenticate the message packets which had arrived previously (Das 2008, p.139). It is critical to note that the nodes possess the key Kv with v<i. In the process, when there is a successful verification event for Kv, the replacement that occurs for the packet that had arrived becomes successful, making Ki to be accepted by the destination node. That prevents any attack based on an already spoofed packet as illustrated below. 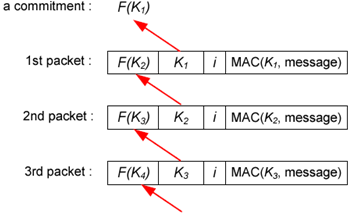 The sequence (F (Kn+1) jKnji) of packet authentication process shown above shows the relationship between the packets on transmission, with i denoting the actual contents of the packet on transmission. Question 1 a) Provide three advantages of using optical fiber. b) Distinguish between "Direct Sequence Modulation" and "Frequency Hopping" c) Decribe the purpose of using "